Combinatorial versus Priority Based Optimization in Resource Constrained Project Scheduling Problems by Nature Inspired Metaheuristics, BEJINARIU, S.-I., COSTIN, H., COSTIN, D.
Broadcast Cognitive Radio with Dirty Paper Coding over Nakagami-m Fading Channel, BASGUMUS, A., NAMDAR, M., TSIFTSIS, T.
Information Extraction Using Distant Supervision and Semantic Similarities, PARK, Y., KANG, S., SEO, J. An Ink-Jet Printed Capacitive Sensor for Angular Position/Velocity Measurements, KRKLJES, D. B., STOJANOVIC, G. M.
Digital Resonant Controller based on Modified Tustin Discretization Method, STOJIC, D.
Among the various breast imaging modalities for breast cancer detection, microwave imaging is attractive due to the high contrast in dielectric properties between the cancerous and normal tissue. Due to this reason, this modality has received a significant interest and attention from the microwave community. This paper presents the survey of the ongoing research in the field of microwave imaging of biological tissues, with major focus on the breast tumor detection application. The existing microwave imaging systems are categorized on the basis of the employed measurement concepts. The advantages and disadvantages of the implemented imaging techniques are discussed. The fundamental tradeoffs between the various system requirements are indicated. Some strategies to overcome these limitations are outlined. K. D. Paulsen, P. M. Meaney, L. C. Gilman, Alternative Breast Imaging. Four Model-Based Approaches, Boston: Springer Science + Business Media, Inc., 2005. P. M. Meaney et al., A Clinical Prototype for Active Microwave Imaging of the Breast. IEEE Transactions on Microwave Theory and Techniques, November 2000, vol. 48, no. 11, pp. 1841-1853. S. Y. Semenov et al., Microwave-Tomographic Imaging of the High Dielectric-Contrast Objects Using Different Image-Reconstruction Approaches, IEEE Transactions on Microwave Theory and Techniques, July 2005, vol. 53, no. 7, pp. 2284-2294. E. C. Fear et al., Enhancing Breast Tumor Detection with Near-Field Imaging. IEEE Microwave Magazine, March 2002, vol. 3, issue 1, pp. 48-56. E. C. Fear, M. A. Stuchly, Microwave Detection of Breast Cancer, IEEE Trans. on Microw. Theory and Tech., 2008, vol. 48, no. 11, pp. 1854-1863. 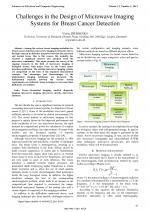 Y. Xie, B. Guo, J. Li, P. Stoica, Novel Multistatic Adaptive Microwave Imaging Methods for Early Breast Cancer Detection, Journal on Applied Signal Processing, 2006, vol. 2006, pp. 1-12. P. Kosmas, C. M. Rappaport, Time Reversal with the FDTD Method for Microwave Breast Cancer Detection. IEEE Trans. on Microwave Theory and Techniques July 2005, vol. 53, no. 7, pp. 2317-2323. V. Zhurbenko, T. Rubak, V. Krozer, and P. Meincke, Design and Realization of a Microwave Three-Dimensional Imaging System with Application to Breast-Cancer Detection, IET Microwaves, Antennas and Propagation, vol. 4, Issue 12, December 2010, pp.2200-2211. V. P. Zharov et al., Combined Interstitial Laser Therapy for Cancer Using Microwave Radiometric Sensor and RODEO MRI Feedback. 1. Microwave radiometry, Proc. of SPIE, July 2001, pp. 370-376. S. P. Poplack et al., Electromagnetic breast imaging: pilot results in women with abnormal mammography, Rad., 2007,v.243, pp.350-359. M. Klemm, I. Craddock, J. Leendertz, A. Preece , R. Benjamin, Experimental and Clinical Results of Breast Cancer Detection Using UWB Microwave Radar, IEEE AP-S International Symposium, 2008. M. Stuchly, S. Stuchly, Dielectric Properties of Biological Substances - Tabulated, Journ. of Microw. Pow., 1980, vol. 15, no. 1, pp. 19-26. M. Lazebnik et al. Large-Scale Study of The Ultrawideband Microwave Dielectric Properties of Normal, Benign and Malignant Breast Tissues Obtained From Cancer Surgeries, Physics in Medicine and Biology, 2007, vol. 52, no. 20, pp. 6093-6115. S. Poplack et al. Electromagnetic Breast Imaging: Average Tissue Property Values in Women With Negative Clinical Findings, Radiology, 2004, vol. 231, no. 2, pp. 571-580. R. Tipa, O. Baltag, Microwave Thermography for Cancer Detection, Rom. Journ. Phys., 2006, vol. 51, Nos. 3-4, pp. 371 377. K. L. Carr, P. Cevasco, P. Dunlea, J. Shaeffer, Radiometric Sensing: An Adjuvant to Mammography to Determine Breast Biopsy. IEEE MTT-S Int. Microwave Symp. Dig. , 2007, vol. 2, pp. 929-932. B. Stec, A. Dobrowolski, W. Susek, Estimation of Deep - seated Profile of Temperature Distribution inside Biological Tissues by Means of Multifrequency Microwave Thermograph. IEEE MTT-S Int. Microwave Symp. Dig., 2002, vol. 3, pp. 2261-2264. S. Y. Semenov et al. Three-Dimensional Microwave Tomography: Initial Experimental Imaging of Animals, IEEE Transactions on Biomedical Engineering, January 2002, vol. 49, no. 1, pp. 55-63. G. Bindu, K. T. Mathew, Characterization of Benign and Malignant Breast Tissues Using 2-D Microwave Tomographic Imaging, Microwave and Optical Technology Letters, October 2007, vol. 49, no. 10, pp. 2340-2345. S. Y. Semenov et al., Three-Dimensional Microwave Tomography: Experimental Prototype of the System and Vector Born Reconstruction Method, IEEE Transactions on Biomedical Engineering, August 1999, vol. 46, no. 8, pp. 937-946. D. Li et al., Parallel-detection Microwave Spectroscopy System for Breast Imaging, Rev. of Scient. Instr., July 2004, vol. 75, no. 7, pp. 2305-2313. T. Gunnarsson et al., Quantitative Imaging Using a 2.45 GHz Planar Camera, 5th World Congr. on Ind. Proc. Tom., Norway, Sept., 2007. M. Pastorino, Recent Inversion Procedures for Microwave Imaging in Biomedical, Subsurface Detection and Nondestructive Evaluation Applications, Measurement, 2004, vol. 36, pp. 257-269. J. C. Bolomey, F. E. Gardiol, Engineering Applications of the Modulated Scatterer Technique, Artech House Publishers, 2001. O. M. Ramahi, M. H. Kermani, Transmission Line Resonators for Breast Tumor Detection. Antennas and Propagation Soc. Int. Symp. , 2005, vol. 3A, pp. 803-806. J.M. Sill et al., T.C. Williams, E.C. Fear, R. Frayne, M. Okoniewski, Realistic Breast Models For Second Generation Tissue Sensing Adaptive Radar System. Proceedings of the Second European Conference on Antennas and Propagation, EuCAP 2007, pp. 1-4. R. Nilavalan, et al., Breast Cancer Tumour Detection Using Microwave Radar Techniques, URSI 2004 International Symposium on Electromagnetic Theory, 2004, vol. 1, pp. 117-119. I. J. Craddock et al., Evaluation of a Hemi-Spherical Wideband Antenna Array For Breast Cancer Imaging, Electromagnetic Theory Symposium, Ottawa, Canada, 2007. W. C. Khor et al., An Ultra Wideband Microwave Imaging System for Breast Cancer Detection, IEICE Trans. Commun. , September 2007, vol. E90-B, no. 9, pp. 2376-2381. H. Wang, M. E. Bialkowski, F. Liu, S. Crozier, FDTD Investigations into UWB Radar Technique of Breast Tumor Detection and Location, Auswireless 2006 Conference Papers. X. Li et al., Experimental Investigation of Microwave Imaging via Space-Time Beamforming for Breast Cancer Detection, IEEE MTT-S Int. Microwave Symp. Dig. , 2003, vol. 1, pp. 379-382. X. Li et al., Microwave Imaging via Space-Time Beamforming: Experimental Investigation of Tumor Detection in Multilayer Breast Phantoms, IEEE Transactions on Microwave Theory and Techniques, August 2004., vol. 52, no. 8, pp. 1856-1865. M. Miyakawa et al., Visualization of the Breast Tumor by the Integrated Use of CP-MCT and Chirp Pulse Microwave Breast Radar, 35th European Microwave Conf. , 2005, vol. 2, pp. 1043-1046. A. Sabouni et al., Hybrid Microwave Tomography Technique for Breast Cancer Imaging, Proc. of the 28th IEEE EMBS Annual Int. Conf., 2006, pp. 4273-4276. D. Pozar M. Microwave Engineering, 2nd ed., John Wiley, Inc., 1998. X. Wu, O. M. Romahi, Near-field Scanning Microwave Microscopy for Detection of Subsurface Biological Anomalies, Antennas and Propagation Soc. Int. Symp. , 2004, vol. 3, pp. 2444-2447. B. Guo et al., Multifrequency Microwave-Induced Thermal Acoustic Imaging for Breast Cancer Detection, IEEE Trans. on Biom. Engineering, Nov. 2007, vol. 54, no. 11, pp. 2000-2010. R.A. Kruger et al., Thermoacoustic CT, IEEE MTT-S Int. Microwave Symp. Dig., 2000, vol. 2, pp. 933-936. G. Ku, L. V. Wanga, Scanning Microwave-Induced Thermoacoustic Tomography: Signal, Resolution, and Contrast, Med. Phys., January 2001, vol. 28, issue 1, pp. 4-10. H. Jiang, C. Li, D. Pearlstone, L. L. Fajardo, Ultrasound-Guided Microwave Imaging of Breast Cancer: Tissue Phantom and Pilot Clinical Experiments, Med. Phys. , August 2005, vol. 32, no. 8, pp. 2528-2535. 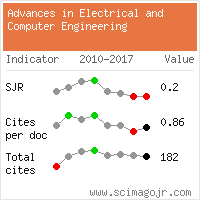 Citations for references updated on 2019-04-19 21:34 in 166 seconds. Website conception, design and maintenance by Eugen COCA. Content updated on 28 Feb 2019. Site engine updated on 28 Feb 2019. This page was generated on the server in 0.018 seconds and loaded in your browser in > seconds.